Learning about composers helps your piano students to become more connected to their music, to understand the influences that shaped each composer’s approach and to feel inspired to seek out more information and more music! 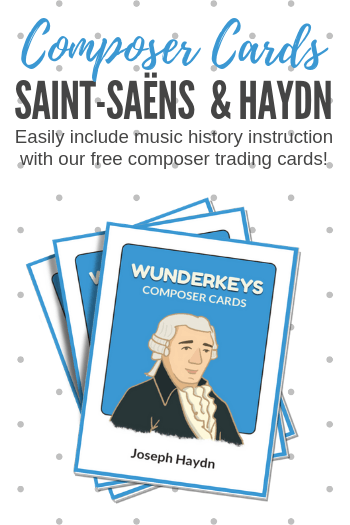 Today we’re sharing two sets of Composer Trading Cards (Hayden and Saint-Saëns) PLUS a fun printable you can use to keep your students building their well-rounded musical foundations. If you haven’t yet used our Composer Trading Cards you may be wondering what they are all about! These cards are the baseball card equivalent of the music world. Each card has an image of a composer on the front and several research-prompting questions on the back. Your students will have a blast collecting the cards, discovering the answers to the questions on the back (with help from a parent), and discussing their findings with you at their next lessons. Today’s new set includes F. J. Hayden and Camille Saint-Saëns. See download instructions below for our new set, plus the previous cards we have released. And wait… there’s more! Today, we’re also sharing a “Mystery Composer” printable that you can use to continue to ramp up the music history fun! Draw an image of the composer on the front of the card. Where To Find Today’s Printable? You can find our two new composers (plus the mystery set) on Teach Piano Today’s WunderKeys.com website. Click here and then select the “Music History” tab. Clicking on each image will lead you to the set of cards that you can print double-sided (I recommend sending to a print shop and requesting that they be printed on glossy card stock for a “real card” feel). 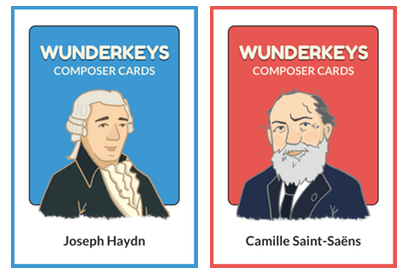 We’d love to know – which Composer Trading Cards are you waiting for? Who would you like to see on an upcoming trading card?